♥ ♥ ♥ TUKRU LOVES YOU. ♥ ♥ ♥: SHOW ME YOUR TATS. i like to scribble on myself. 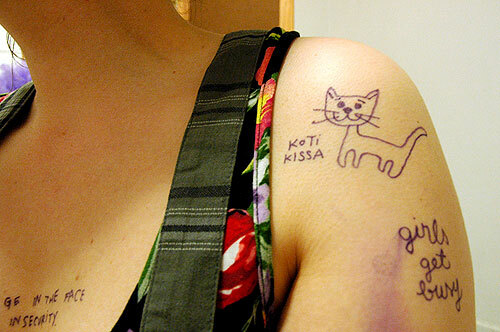 i think my first one will be pretty similar to the kitty cat one, where i've scribbled it. kotikissa is finnish for "home cat" or a homebody. i am one. i want one including the word "seikkailuun" on my other shoulder, same place. it means "towards adventure". i'm thinking that should involve a unicorn somehow. 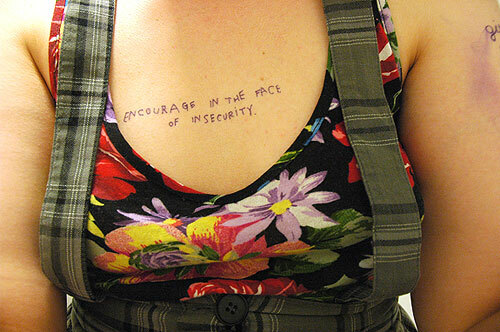 How did you manage to write on yourself so neatly? I can't do that for anything!